A man shot his grandmother and girlfriend in South Los Angeles then led police on a chase to Silver Lake, where he exchanged gunfire with officers and barricaded himself inside a Trader Joe’s store where a woman was fatally shot. It was not immediately clear whether the suspect shot the woman or if she was killed in the crossfire of the gun battle with police as the man fled into the market. The suspect remained inside the Trader Joe’s for about three hours before surrendering to police late Saturday. Melyda Corado, 27, manager of the Silverlake Trader Joe’s was identified as by her brother Albert Corado as the woman who was killed. Albert Corado first Tweeted that his sister worked at the Trader Joe’s and that the family could not contact her, but later confirmed she was the shooting victim. 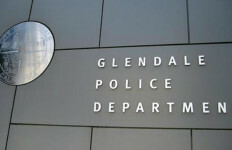 Los Angeles police Chief Michel Moore said the circumstances of the woman’s death were still unclear. It was not immediately known where the woman was when she was shot. Los Angeles Mayor Eric Garcetti added his condolences as well. 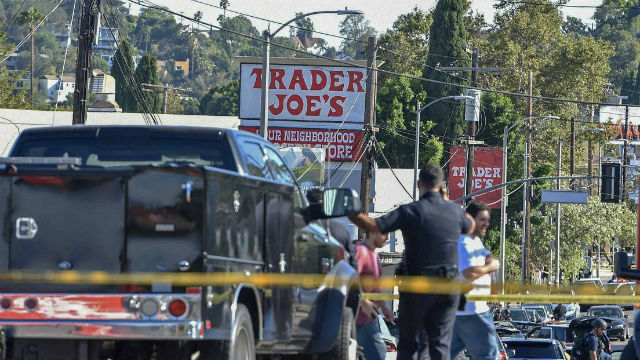 “Our hearts break for the victim killed at the #SilverLake #TraderJoes and their loved ones,” Garcetti posted on Twitter. Officials with Trader Joe’s issued a statement late Saturday praising police and vowing to help its employees heal. Officers said they are still processing the scene Sunday and that Hyperion Avenue between Griffith Park Boulevard and Ettrick Street would remain closed until at least noon. According to police, the incident began when the 28-year-old suspect got into a family dispute at 1:30 p.m. in the 1600 block of East 32nd Street in South Los Angeles and shot his grandmother. Garcetti said the woman was shot about seven times. She was initially taken to a hospital in grave condition where she underwent surgery and was later considered critical, Moore said. After the shooting, the suspect took his grandmother’s car — a 2015 four-door Toyota Camry sedan — and fled, forcing his injured girlfriend to go with him, police said. Using a LoJack system, police traced the vehicle to the Hollywood area and gave chase, leading to Silver Lake, where the suspect crashed the Toyota into a power pole at 3:30 p.m. in front of the Trader Joe’s supermarket in the 2700 block of Hyperion Avenue. The suspect allegedly opened fire at police, who returned fire, leaving the rear window of the Toyota shattered. The man got out of the car and ran into the store. A witness told CBS2 the man was firing toward officers as he ran. Moore later said about 40 people were believed to be in the store when the suspect entered. A short time later, a woman was seen being dragged away from the store’s entryway and then being treated by paramedics. Authorities said paramedics tried to revive the woman, now identified as Melyda Corado, but she was pronounced dead. Meanwhile, as the suspect entered the store, employees and customers inside scrambled for cover. Some were seen escaping through a window toward the rear of the business and crawling down a ladder to safety. Police were seen carrying several children away from the building. As the standoff unfolded, the LAPD went on a citywide tactical alert, keeping all available officers on duty beyond their shifts to ensure enough personnel were available to respond to the barricade situation. The man was treated for a gunshot injury to his left arm. His name has not been released. “He (the suspect) went in his room and grabbed a gun and shot her,” Egland told City News, saying he fired several shots before he and his girlfriend fled in the grandmother’s car. Margaret Stewart of the Los Angeles Fire Department said paramedics treated 10 people at the scene of the Trader Joe’s, including the suspect, his girlfriend and the woman who died. A 12-year-old boy, a 41-year-old woman, a 70-year-old woman and an 81-year-old woman were all hospitalized with minor injuries and listed in fair condition, she said.